At long last, we're launching the eGerbil virtual Xmas-show. We'll be accepting entries for all categories, except Halloween, until midnight, Eastern Standard Time (GMT - 5:00 h) , Saturday 15th December. Halloween entries will now be accepted until midnight EST, Sunday, 11 November. Please P.M. your picture(s) to either Indyrascal or Cliveandcharlie. Winners of first, second and third place will receive a certificate and rosette which will be sent to you once the winners have been announced. Gerbil legend category: For those gerbils who have passed on, but still hold a special place in our hearts and memories. 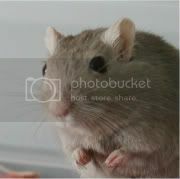 Post a picture and write a paragraph about what made your gerbil unique. “Other pets”: Any other pet you’d like to enter in the contest who is not a gerbil. Best Halloween-themed gerbil picture. Be creative! Cutest pup(s) - 1-4 weeks old, 4-8 weeks old will be the two categories for this. Good luck! We're looking forward to viewing the entries.